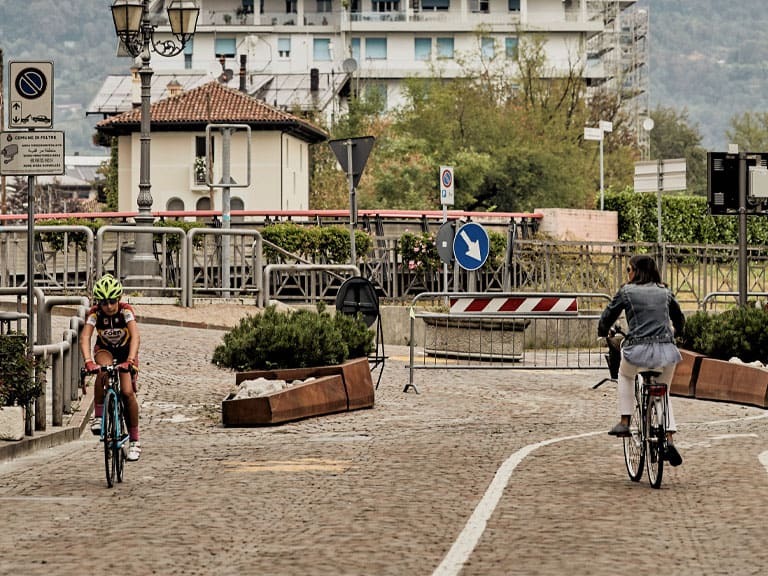 I’m travelling to the Mecca of cycling, Fonzaso, in Italy’s Belluno province. I survey the rolling landscape from our van window as Monte Grappa beckons in the distance, a reminder of the history this part of the Venetian Prealps contains. Even better, I’ll be in the hands of Castelli, the cycling brand of all cycling brands. As a lifelong enthusiast, this trip is hard to grasp – but I’m buzzing and can’t wait to get out and begin exploring. We arrive at the villa we’ll be calling home, and I quickly realize my accommodation isn’t an ordinary layover. It’s placed in a lush valley surrounded by arching mountains – a blend of ancient and modern architecture. An adorable mamma armed with prosecco approaches with a charming smile. The first night in the villa is beyond enchanting. But really, who could be a better guide than a legendary Italian brand so entrenched in the region? 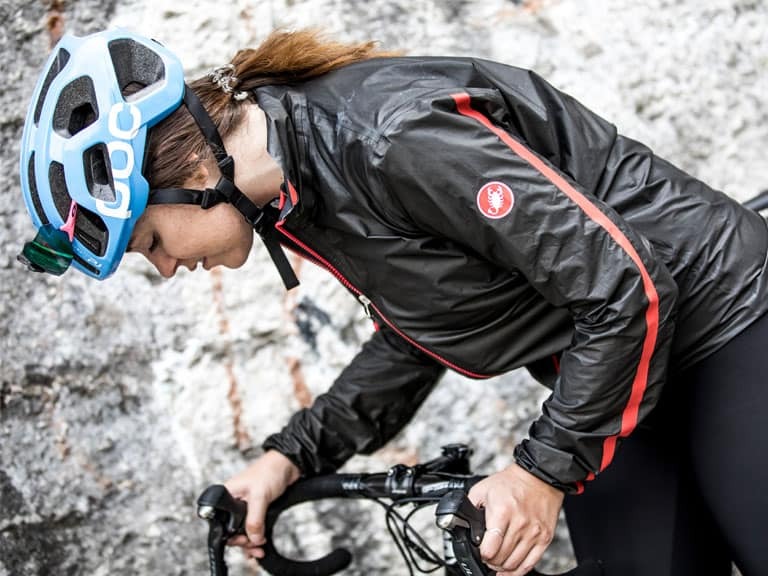 While the cycling apparel industry may be booming, no company combines technical, high-quality designs and style like Castelli. In many ways, they’ve helped define the sport, with roots tied to the very beginnings of its competitions. Even today the Cremonese family still holds the reins, leading Castelli into another era of innovation while paying homage to their heritage. Doctor Giordano Cremonese is buffered by his four children as he continues to steer his company as he’s done since 1963. 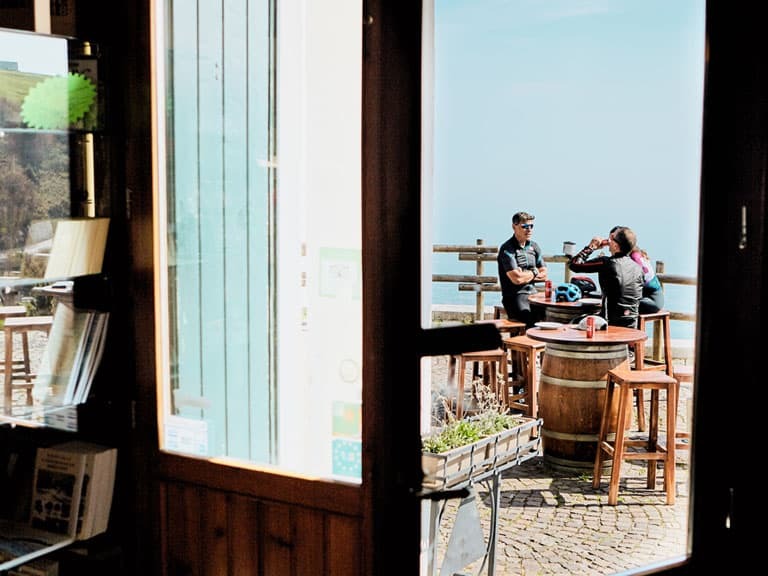 I wake up to the call of the villa’s rooster, down my breakfast of sweets and espresso, and it’s off to brand headquarters in the nearby Dolomite Mountains. The twisting drive is like meandering through a playground of the gods, with lurching summits and contorted rock overarching the narrow road. The brand headquarters is part museum and science lab – a bustling and inspirational building that honors company history but with a focus toward the future. Founder Maurizio Castelli introduced multiple innovations to the cycling world, such as Lycra and print sublimation on bibs and jerseys. This spirit of discovery continues to fuel the workspace. 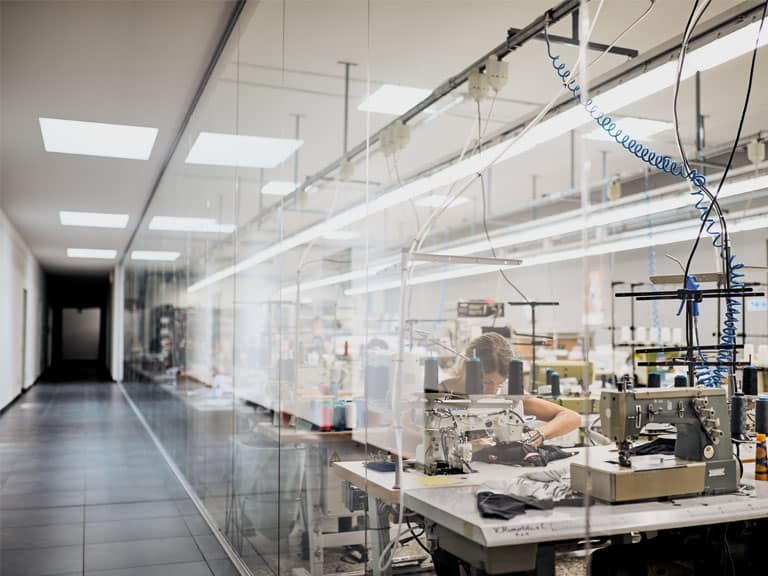 The prototype sewing room is no exception, with workers zoned in on hand-stitching the latest gear suitable for both pro and casual riders. We also grab a sneak peek at the 2019 Sky Team apparel courtesy of Steve, an affable American designer and recent transplant to the Italian headquarters, who is now at home here in the birthplace of cycling. Castelli’s team of professional riders serves another purpose apart from striving for victory and recognition. They test new products under the most extreme circumstances, putting every new design through the paces – ensuring a quality capable of performing on Grand Tours like the Tour de France and Giro D’Italia. As we gaze over the Wall of Fame, I can’t help but imagine what testing some gear would be like while I’m here in the cradle of cycling. Fortunately, a post-lunch ride is on the agenda. It’s not every day you get to ride the Dolomites – but here I am kitted out in new Aero Race 4 shorts and Aero Race 6.0 FZ jersey. Before mounting our bikes, I notice the shorts breathing under the warm September sun, and the stretchy jersey sleeves holding their place without discomfort. I slip an energy bar and my iPhone into my jersey pockets, and we begin riding up the mountain taking in the late-summer scenery. Our route is not for the faint-of-heart. 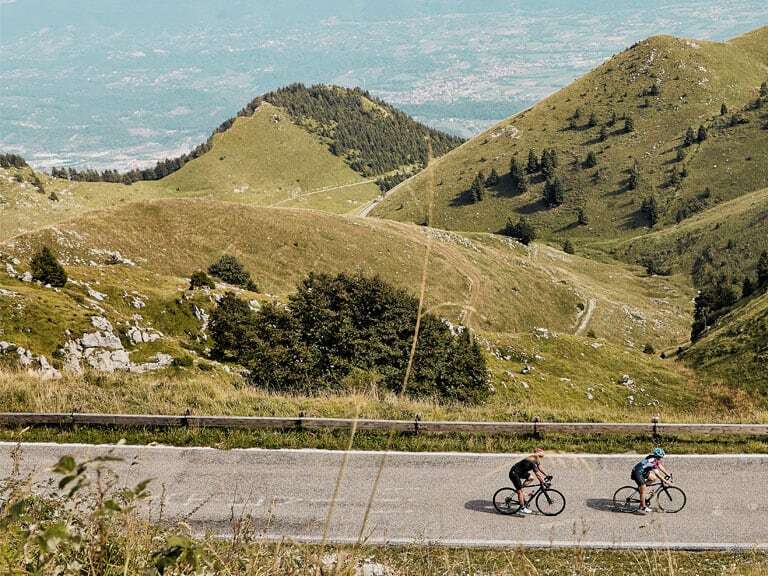 The monte part of Monte Grappa is now understandable, as we pedal into a 7-degree incline that runs 27 kilometers. The burning in my legs and sweat-drenched forehead were telling me as much. Our local guides seem content with the leisure of the ride, showcasing their granite-chiseled thighs doing the heavy pedaling. I survey the red Castelli Scorpions on the back of their jerseys and drive my legs harder to keep pace. At the summit, we refuel with fatty prosciutto, capicola and a Brio booster for the way down. We descend leisurely on steep, immaculate roads that open to incredible vistas. I now take the time to stop and snap photos of the surroundings, confirming my long-held belief that cycling plus Nature is an unbeatable combination – good for the body and soul. The sun dips as we reach the foot of the mountain. I don’t bat an eyelash when the team suggests riding directly over to the restaurant where we’ll meet more of our hosts from the company. My shorts and jersey are already dry, and I feel comfortable entering the eatery in my cycling outfit. We’re a little late to the sitting, like any good Italian would be. 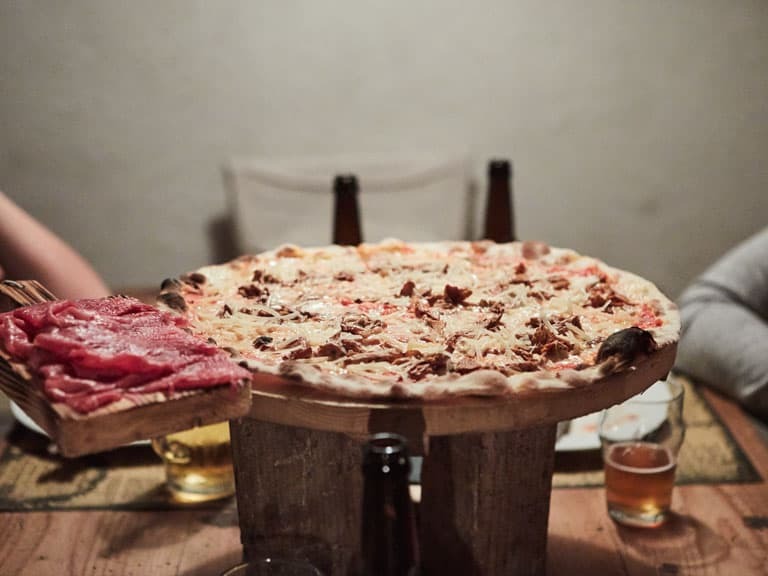 The pizza – some of the best I’ve ever had – and the crisp micro-brew beer is the perfect nightcap after the ride. Then I’m whisked back to the villa and off to bed, only to rise a bit too early thanks again to the rooster. After another glorious breakfast of sweets and caffe latte, I’m headed off to another day adventure. The weather has turned unseasonably cool, so I’m outfitted in a longer insulated bib and the IDRO Gore-Tex waterproof riding jacket. The weight of the jacket is almost non-existent. Our ride takes us along flatter, snaking roads through miles of rustic country-side dotted with charming villas and villages. We stop in a settlement for lunch, this time with an animated chef who presents us with the best ravioli – really – I’ve ever had. Cycling back through the charming scenery, I feel comfortable and don’t notice the damp weather at all. The Last Supper, Castelli-Style is a beautiful night of fun, friends, and fantastic food. My passionately charismatic hosts drive home the genuineness of the people behind the brand and Scorpion logo, embodying everything good about the cycling community. Flying back to the winding highways of Quebec and autumn cycling is hard. One thought makes it easier – not once have I ever been tempted to wear anything while out on the road except Castelli.